From R211.00 per person: Jikeleza Lodge Backpackers – Explore the revamped young heart of Port Elizabeth. Jikeleza Backpackers is just a few streets away from buzzing nightlife. Clubs range from hip hop, African house to radio funk. Lounge in on street couches at the Cafés, sip cocktails or chow down on local fare. Visit live music and theatre shows, banks, post office, pubs and 24 hour shops. All you fancy is a brisk walk away.After a long day on the road, relax with a local movie, or chill in the tranquil shady garden and slap a steak on the braai. Sleep in sunny airy dorms/rooms or quaint wood units in the garden wander through the history of Olde Worlde Central, experience trendy art meccas and meet the locals. The friendly staff will help you book or get advice on anything to anywhere. Jikeleza Backpackers is an International Backpackers Hostel. You’ll find it safe clean and comfortable offering a true African experience and South African hospitality. It is designed by travellers for travellers to meet in a home away from home atmosphere. The hostel has a reputation for making you feel welcome and is enthusiastically run by the owners and their manager. The old building with all its gleaming wood and warm, atmospheric charm is a stone’s throw from everything. The owners are fanatical about cleanliness and all the staffs are friendly and go out of their way to help you. The Backpackers is set right in the heart of the old historical Port Elizabeth city and right on the Donkin Heritage walking trail. 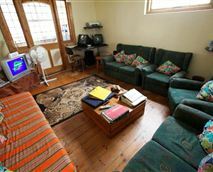 Jikeleza Backpackers offers you a variety of accommodation. There are single rooms, double rooms with double bed and twin rooms with two single beds, three, four and five bed family/group rooms, dorms and camping. The hostel is never crowded and their dorms only have a maximum of seven beds and at times are smaller. The dorms are mixed, both male and female, and may not be suitable for some local holiday makers who are not conversant with traveling etiquette. The kitchen is fully fitted so that you can whip up a quick meal or cook up a storm. Jikeleza Backpackers has its own in-house travel desk and is the best place to get advice on anything to anywhere. They can arrange day trips to Addo Elephant National Park, lion safaris to Schotia, city and township tours, Baz Bus and Intercape Inter City Bus tickets, historical and heritage tours, transfers and overland trips and tours anywhere in Southern Africa. They also have specially priced accommodation and tour packages for backpackers and you can save quite a lot if you take one of these. From R215.00 per person: Brighton Mews Guest Suites – We provide affordable, first-rate family accommodation with our three private self-catering units; there are two One-bedroom Units which have double and single beds, spacious showers in private bathrooms, living areas with sleeper couches, private balconies and full kitchens. There is one Studio Unit with a double bed, a full bathroom, a living area with a sleeper couch, a spacious work desk and a kitchenette. All units are fully fitted and equipped, including safe deposit boxes. There is on-site secure parking and an alarm system for guests to use. We are located within strolling distance of Pollok Beach, the Summerstrand Shopping Village and within easy reach of all the Summerstrand campuses of the Nelson Mandela Metropolitan University, the Boardwalk and Hobie Beach. Port Elizabeth offers a diverse selection of attractions as a family-fun holiday destination. In addition to the beaches, it includes scenic nature trails, historic heritage, magnificent wildlife close by, cultural experiences and a variety of water sport activities. Beach: We are within a short walking distance of the beach. The Self-Catering Studio Unit sleeps 4 and is furnished with a double bed as well as a double sleeper couch in the living area and the private bathroom consists of a bath with a shower overhead. The unit is also equipped with a spacious work desk, a kitchenette with a stove top, an under counter fridge and a microwave oven. Could We Attract 17 Million Tourists?